Add cake to a large bowl and crumble until fine crumbs are formed. Add jam and mix the cake and jam with your hands until cake is moist and when you form small balls they can hold their shape. Form small balls and place them on a plate. Melt a little bit of chocolate (20-30 g) a bain-marie (a heat-proof bowl over a saucepan of simmering water), or microwave. 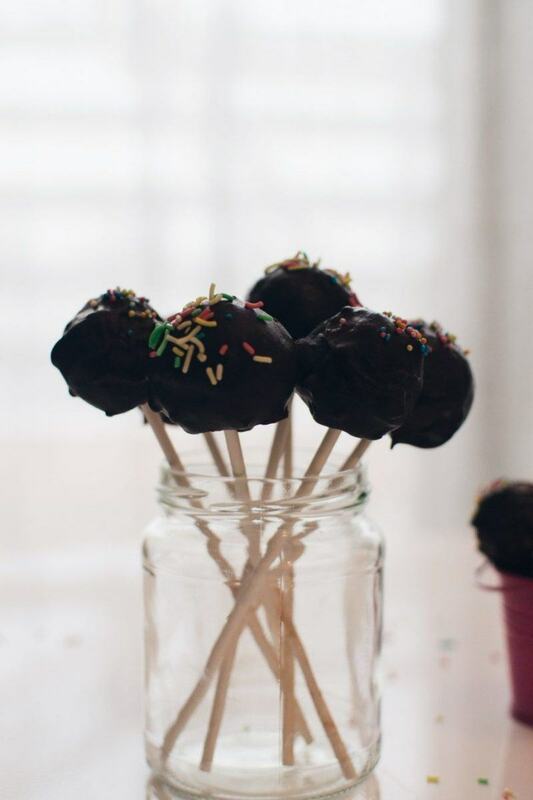 Dip the tip of the cake pop sticks into chocolate and insert into the cake balls about half-way. Freeze for about 15-20 minutes. Meanwhile, prepare your working area. Melt the chocolate and pour it into a large and deep cup. Get the sprinkles and also a medium bowl filled with rice. Remove cake balls from freezer and start dipping each one into chocolate until covered. Let the excess chocolate drip off and put the cake pops in the bowl filled with rice, making sure they stand up. Place cake pops in the fridge so the chocolate hardens completely.